WASHINGTON (Aug. 05, 2009) -- The Army's best recruiters and career counselors were honored during a ceremony Aug. 5, at the Pentagon for their contributions to the all-volunteer force. This year, for the first time, a medical recruiter was named Army recruiter of the year. Sgt. 1st Class Strate V. Flessas, Army Career Counselor of the Year; Sgt. 1st Class Anika Anderson-Hack, Army Recruiter of the Year; Sgt. 1st Class Shateria Rahming, Army Reserve Recruiter of the Year; Sgt. 1st Class Gonzalo L. Fernandez, Army National Guard Recruiter/Retention Noncommissioned Officer of the Year and Sgt. 1st Class Boris O. Cornejo, Army Reserve Career Counselor of the Year received awards for excellence in recruiting and career counseling during a ceremony Aug. 5, at the Pentagon. Secretary of the Army Pete Geren presented the awards. "It was an honor -- I don't think they took us as seriously as maybe we would have liked them to," said Sgt. 1st Class Anika Anderson-Hack, 5th Medical Recruiting Battalion, and Army Recruiter of the Year. "So I think it was a bit of a surprise to them that a medical recruiter would actually bring home the hardware." Anderson-Hack's job is to get medical professionals to join the Army. That means doctors, nurses and dentists -- people who already have college degrees and are looking for jobs in the civilian world. "We have a difficult mission because we have to find medical professionals and get them to want to serve their country," she said. "Most of the people in a medical career are there because they want to serve somebody. We have to convince them to give that service to Soldiers." 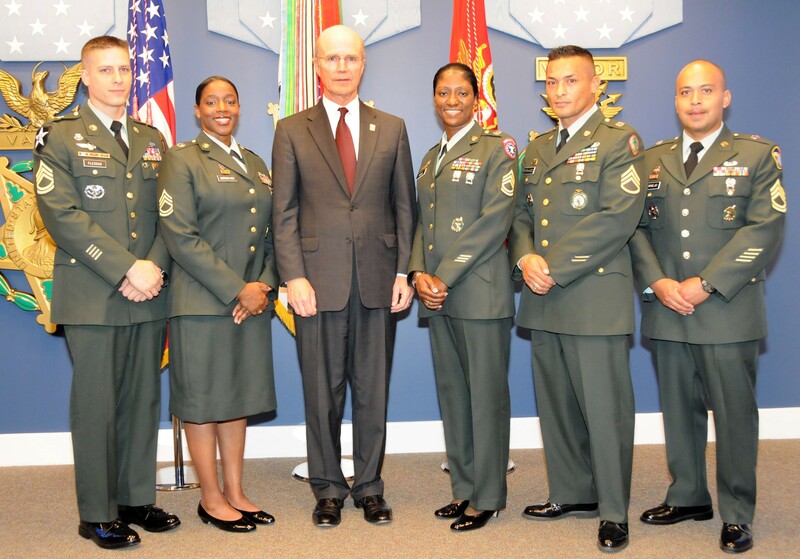 In 2008, Anderson-Hack was able to convince 12 civilians to become Army medical officers. That was double the mission that was given to her. And this year, she's on target again for her mission and hopes to again get 200 percent of her target. "The Army doesn't stop needing doctors and nurses," she said. "So I can't stop providing them." Sgt. 1st Class Shateria Rahming, Miami Recruiting Battalion, was named Army Reserve Recruiter of the Year. She said convincing high school graduates to consider the Army is no problem -- it's the parents that need convincing. "You have that mom and dad saying, no, my child is not going in the Army," she said. "(I) have to tell them my story -- what the Army has done for me and what it can do for their child." Talking about college money helps too, she said. Some kids want to join up with the Reserve so they can have the money to go to school, because there's just no other way to make college happen. "I tell the kids I can pay for your college and you can serve in the Reserve part time," she said. And for parents, "Some of them you say, this is what your kid wants to do. He's not getting that scholarship...let him go to school. I have to be as honest as possible with the parents." During the ceremony to honor the award recipients, Secretary of the Army Pete Geren commented on how important recruiting and retention are for the Army. "Recruiting and retention are two sides of the same coin, and are critically important to the health of our Army," he said. Geren said the Army this year will recruit some 150,000 Soldiers into the active-duty force, the Army Reserve and the Army National Guard. To get those recruits, the Army must compete with industry for the best -- the top 30 percent of young Americans -- to fill its ranks. "It's the same young people everybody in industry is after," Geren said. "They have a lot of choices and we are able to attract them into this Army because they want to be a part of something greater than themselves and because we have our outstanding recruiters out there."